Ontological Quality has been the subject of extensive research due to the importance of ensuring that a system's underlying ontologies are fit for purpose. Understanding quality problems may not be straightforward, depending on the ontologies' magnitude and complexity, the nature and extent of the problems, and the metrics used in its quality assessment. 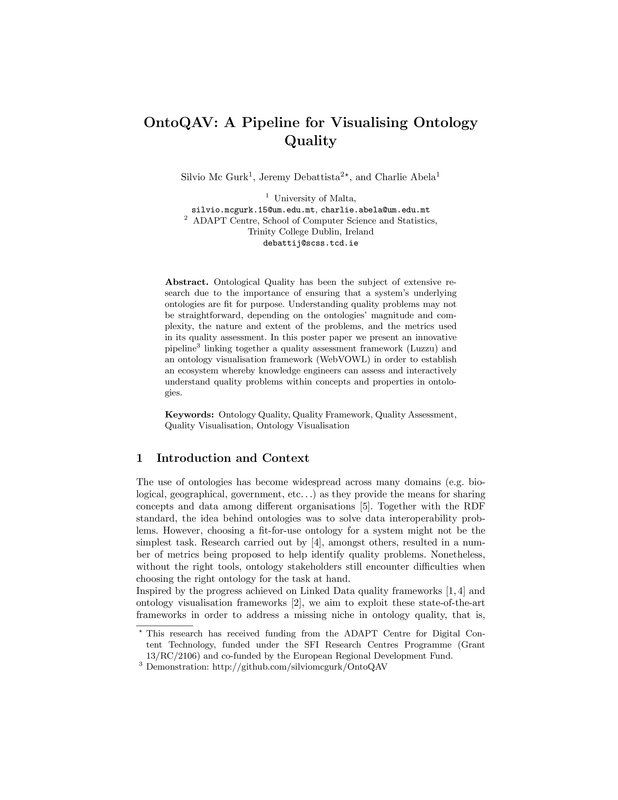 In this poster paper we present an innovative pipeline linking together a quality assessment framework (Luzzu) and an ontology visualisation framework (WebVOWL) in order to establish an ecosystem whereby knowledge engineers can assess and interactively understand quality problems within concepts and properties in ontologies.